Head of the Al-Hikma National Movement, Sayyid Ammar al-Hakim, in his office in Baghdad received Turkmen Front delegation headed by Arshad al-Salihi and discussed latest developments in the political situation, forming the next government and the largest bloc, his eminence indicated the importance of the national majority as a choice capable of achieving the aspirations of the people and provide services. His eminence reiterated his position on excluding the government from political defiance and disagreements, stressed on making a government in accordance with the conditions laid down by the supreme religious authority. 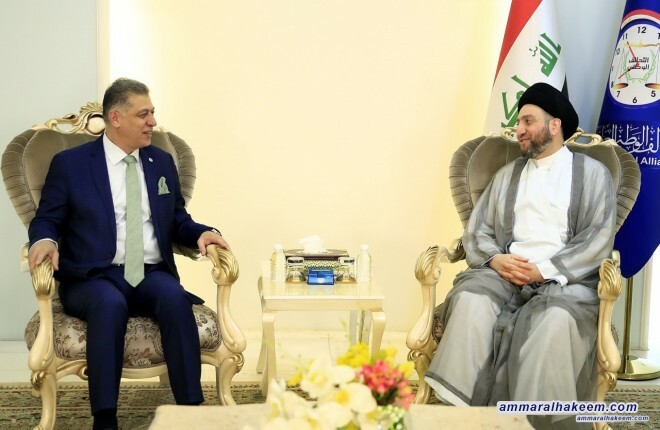 His eminence praised the role played by the Turkmen component in building the Iraqi democratic experience and their role in combating terrorism and confronting Daesh, stressed that Turkmen should have their entitlements as original citizens in Iraq. Salihi praised the historical relationship and continued support provided by his eminence for the Turkmen component and shares political aspirations.